October 1, 2016 The Great Sky, by D.G. 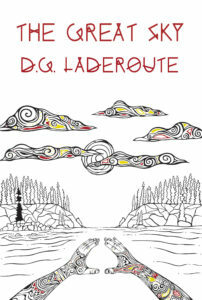 Laderoute releases in both print and eBook. The YA novel, the second by Thunder Bay writer, D.G. Laderoute, is an urban fantasy. The first time Piper Preach died he was ten years old. But the Anishnaabe spirits thought otherwise. Now, six year later, Piper struggles with the hard realities of life in a big city. The ancient ways of his people are a distant memory. But the spirits aren’t done with him. Pulled into their bizarre world, the place the Anishnaabe call The Great Sky, he’s plunged into the middle of a brutal war raging just a step away from reality. And this time there may be no escaping death – or even worse. This is a tense, tight read, well-researched and with an authoritative voice. I met Patrick Hunter in Sault Ste. Marie, Ontario, when he was attending Sault College for graphic design. When I found out we shared a hometown in Red Lake, Ontario, I immediately requested he join The Medicine Factory Studio. This was a youth-run and shared studio space with a revolving door of artists, based out of downtown Sault Ste. Marie. In the spring of 2011, The Medicine Factory had the opportunity to exhibit at the Art Gallery of Algoma, and Patrick was the sole graphic designer for this inaugural exhibition entitled Recent Works from the Factory. As for his visual arts practice, Patrick’s vibrantly coloured paintings are deeply connected to the legacy of groundbreaking artists to emerge from Red Lake, Ontario. The birthplace of the woodlands style, Red Lake was home to the Triple K Co-operative, which was a native run silkscreen co-operative launched by the Kakegamic family and Norval Morrisseau in the late 1970s. Like the works of Morrisseau, Patrick’s paintings resonate feelings beyond the pictorial. The electricity in the oscillations of a wolfs howl are described in the simultaneous contrast of white and blue; Patrick adds motion to the flat surface through his skillful use of colour, transforming the static into the spiritual. In the North, a self-deterministic attitude is inseparable from the practice of an artist. Patrick Hunter is no exception to this rule. Alongside his fine arts and graphic design practice, he is also a community organizer. Patrick played a key role in the coordination of Death to Winter Fest in the winter of 2013, a visual arts exhibition and musical concert, which highlighted the next generation of emerging young artists in Red Lake. Patrick recently received his name, Kewadinaang (ka-way-din-an,) or North Star. As a natural leader, Patrick has already guided me to return to Red Lake. His work inspires an appreciation in the importance of protecting the innate beauty that exists in Northern Ontario. There is legacy in our land, and its rich history resides in our lives, echoing in our work. Patrick Hunter currently divides his time between working in Toronto as a freelance artist/graphic designer, and retreating to the land that inspires him, our home, Red Lake. I got slightly intimidated by how cool the book is. I really liked the spider character motif, [in the novel, for the text separators] how he patches up the holes to the spirit world. 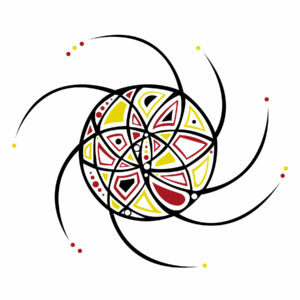 The graphic represents a patch, and takes from the dream catcher as well which only allows the good dreams to come to you. 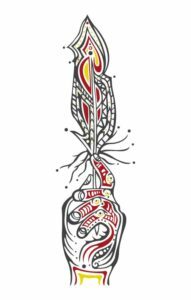 It can also represent the circle of life with the hoop, but as we find out in the book there’s more to life than just this life; you can spin off into many different directions after, whether it be the long road, or staying in the spirit world or wherever. The cover art: I wanted it to reflect not only my style of work, but also what could be a scene from the book. In the image, a figure’s hands are raised offering thanks to the sun and the sky and the clouds. With my paintings and illustrations I like to believe that I’m painting the spirit of what it is I’m depicting, which is why the clouds, the sun and the arms look the way they do. That’s their spiritual energy, flowing and pulsing. The rock faces and trees on the horizon represent where the book begins when Piper collapses the cliff face. I did it two ways, on the left is the collapsed cliff face and on the right it’s not collapsed. I did a mirror image of it because I wanted to contrast the idea of the spirit world vs our world, and on one side he collapsed it, and the other he didn’t and it maybe raises the question – would he have discovered his abilities if he didn’t? Action vs. reaction, sort of thing. The other image is of a graphic piece I created [for the chapter graphic], that sort of sparked the idea of using the hands, especially if we went with the Four Colours scheme for it. The interior graphics will appear in black and white in the print version, and colour in the eBook. Whichever form you choose, we think you will find Patrick Hunter’s art is a perfect compliment to D.G. Laderoute’s fascinating story. The Great Sky releases October 1, 2016, and will be available directly from Five Rivers, and through online booksellers worldwide. Five Rivers is accepting advance orders.